I'm posting a "forgotten book" a little earlier (but hey, it's Friday somewhere!). 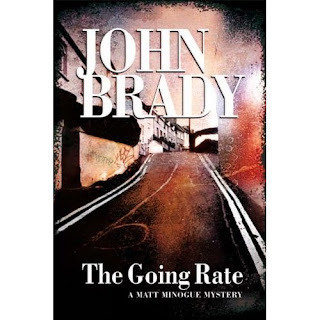 John Brady’s The Going Rate is not so much a forgotten book as an overlooked one. Published in 2008 by his Canadian publisher, McArthur & Co., I saw nothing at all about the existence of the book until, in my regular (but obviously not regular enough) search for anything new by Brady, I discovered a couple of weeks ago that The Going Rate, his 10th crime novel and the 9th in the series featuring Dublin Garda Detective Matt Minogue, was published two years ago. Brady’s forte is voices: the dialogue among the police crackles with the officers slagging one another and speaking obliquely about the matter at hand (as people do speak when they work together, not needing to explain everything). The cops are working in Dublin but mostly from somewhere else in the country, and they often trade insults about the country versus the city and various stereotypes about the regional characteristics of the Irish. The Going Rate is, for my taste, one of Brady’s best books. It shares a bit of plot and setting with Declan Hughes’s recent City of Lost Girls (both deal with old friends involved in the film business, meeting in Dublin pubs to discuss their past and their hopes for future projects), but (again, to my taste) The Going Rate is a better book. It deals with very concrete, individual relations and crimes, whose consequences are presented vividly in their effect on families and suspects, and with an established but struggling screenwriter trying to pitch a TV series, where City of Lost Girls is involved in international cinema personalities and an international serial killer. Nothing wrong with oversized and self important personalities or with globe-hopping serial killers, but I’m more inclined toward stories of regular folks and ordinary crimes. The two narrative threads of The Going Rate, which takes place at the cusp of the collapse of the Celtic Tiger, follow Minogue, now promoted off the streets and into an international liaison office, and Dermot Fanning, the struggling screenwriter, whose wife supports the famiy (including a toddler) by teaching school. Fanning has made contact with Minogue’s former partner, Tommy Malone (now in the drug squad) and with a petty gangster named Murph, in order to get details to add realism to his script for a series about the Dublin underworld (The Wire is mentioned in passing as a possible model). Murph takes Fanning to a dogfight, where they come to the attention of the sinister Cully (who sometimes talks like a Dubliner, sometimes like a Londoner), who “takes over” Fanning from Murph. Meanwhile, Minogue has become involved in the investigation of the beating death of Polish immigrant (and there’s a great deal of material about immigration and its consequences for Irish society). A group of teenagers becomes involved, and the interrogation of these 4 uncooperative kids (and what they did or didn’t do to the dead Pole) is an important part of the story, along with Minogue’s involvement with the detectives at the Garda station assigned to the crime. There is also some carryover here from the previous Minogue book, Islandbridge, concerning the disgrace of Minogue’s colleague and mentor, Superintendent Kilmartin, but it’s possible to catch up with that plot element without having read the previous book. There’s always an element of the comic in Brady’s books, particularly in the dialogue (and a reader has to pay attention to the subtext of the dialogue to get the humor and even the point of the conversation). But as the two segments of the plot move toward one another (and the Fanning plot begins to take up more of the space of the story) a subtle but pervading sense of tragic inevitability darkens the novel, reminding me of some of Graham Greene’s crime stories: you know that Fanning is in over his head, tempted not only by the promise of a “genuine” tone for his TV script but also by the danger and thrill of the underworld, and you know that Cully is somehow wrong, but the reader has to infer a lot of what is to come by the lapses in their dialogue, the refusals of one of them to answer the other’s questions and of Fanning to allow his common sense to pull him out of the relationship. The climax is sudden and shocking, the story is ultimately resolved quietly, in conversation among detectives, partly as they intrude upon a crime scene where they have no business being: the subtlety perfectly sets off the violence and tragedy of what has gone before. Brady is very good at giving a reader a vivid visual and auditory scene without dwelling on the more obvious plot (which is often occurring “off-camera”). That technique focuses the reader’s attention on the characters and their interrelationships (and conversations). The result, particularly in The Going Rate (whose title resonates with several aspects of the book’s overt plot and social subtexts), is a very good crime novel that copiously deserves a wider readership. I don’t know if the fact that Brady emigrated from Ireland to Canada (though he still spends considerable time in Ireland) has limited his inclusion in the attention currently being paid to Irish crime writing, but he is one of the unsung pioneers of the high level of crime fiction in and about Ireland. His skill in indirect storytelling and engaging dialogue (as well as drawing his characters and the country into a wider social context) has continued to grow since his first novel appeared in 1988, and it would be a shame if his books were limited, because of his residence or the location of his publisher, to only a Canadian readership can appreciate the newest Minogue book (or the new one, apparently titled The Coast Road) scheduled to be published by McArthur & Co. later this year. thanks, Glenn. You've definitely perked my interest for this one! Now on the hunt for a copy. It's always Friday on Thursday here. Thank, Glenn. This looks excellent. Thank you. Brady is one of my favourites. I can't believe the trouble I have to go to to get his books. I was going to write -a much underrated writer -but more accurately, he is almost unknown. Another favourite -forgotten and hard to get --Marshall Browne. Clearly, I'm late to this party, but wanted to say how much I enjoyed your review of The Going Rate. Brady is one of my favorite writers and I am always happy to see his name accompanied by excellent press. Characters, dialog, story: he has it all, the best writer people (enough of them) aren't reading. So far, The Coast Road is only available in Canada and I feel as though I've been waiting much too long for it. The extra shipping to the US will be worth it. "Historical" fake police raid, etc.